This article talks about a new feature that allows the administration of the application's users and groups using an intuitive and friendly user interface that comes integrated in both jBPM and Drools Workbenches. Before the installation, setup and usage of this feature, this article talks about some previous concepts that need to be completely understood for the further usage. This feature is included from version 6.4.0.Final. A security environment is usually provided by the use of a realm. Realms are used to restrict the access for the different application's resources. So realms contains information about the users, groups, roles, permissions and and any other related information. In most of the typical scenarios the application's security is delegated to the container's security mechanism, which consumes a given realm at same time. It's important to consider that there exist several realm implementations, for example Wildfly provides a realm based on the application-users.properties/application-roles.properties files, Tomcat provides a realm based on the tomcat-users.xml file, etc. So keep in mind that there is no single security realm to rely on, it can be different in each installation. The jBPM and Drools workbenches are not an exception, they're build on top Uberfire framework (aka UF), which delegates the authorization and authentication to the underlying container's security environment as well, so the consumed realm is given by the concrete deployment configuration. Due to the potential different security environments that have to be supported, the users and groups management provides a well defined management services API with some default built-in security management providers. A security management provider is the formal name given to a concrete user and group management service implementation for a given realm. 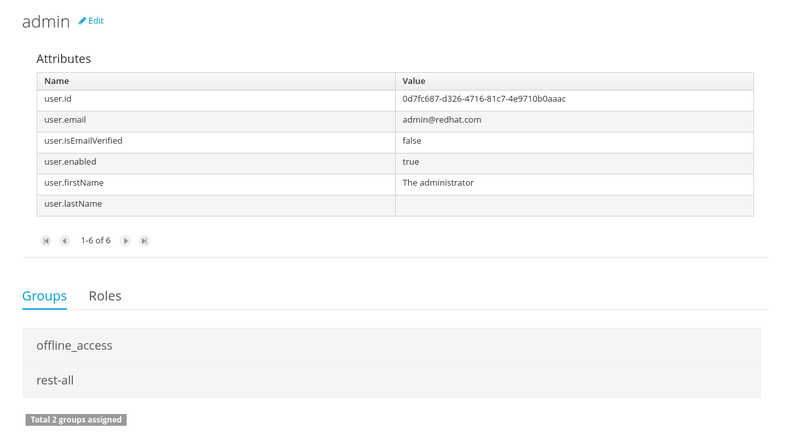 Wildfly / EAP security management provider - Realms based on properties files. Tomcat security management provider - Realms based on XML files. Keycloak security management provider - For the administration of Keycloak based realms. This provider is included as technical preview for the next 7.0 series, currently in development. Keep updated on new security management providers on further releases. You can easily build and register your own security management provider if non of the defaults fits in your environment. As you can see, it's based on key-value pairs where the key is the username, and the value is the hashed value for the user's password. So a user is just defined by the key, by its username, it does not have a name nor address, etc. Each security management provider must specify a set of capabilities supported. From the previous examples you can note that the Wildfly security management provider does not support the capability for the management of the attributes for a user - the user is only composed by the user name. On the other hand the Keycloak provider does support this capability. The different views and user interface components rely on the capabilities supported by each provider, so if a capability is not supported by the provider in use, the UI does not provide the views for the management of that capability. As an example, consider that a concrete provider does not support deleting users - the delete user button on the user interface will be not available. Please take a look at the concrete service provider documentation to check all the supported capabilities for each one, the default ones can be found here. If the security environment is not supported by any of the default providers, you can build your own. Please keep updated on further articles about how to create a custom security management provider. If your realm settings are different from the defaults, please read each provider's documentation in order to apply the concrete settings. NOTE: If no security management provider is installed in the application, there will be no available user interface for managing the security realm. Once a security management provider is installed and setup, the user and group management user interfaces are automatically enabled and accessible from the main menu. If the concrete provider you're using requires more libraries, add those as well. Please read each provider's documentation for more information. 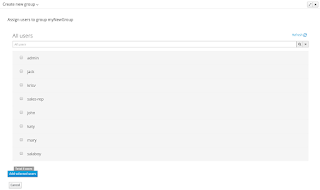 Replace the whole content for file WEB-INF/classes/security-management.properties, or if not present, create it. The settings present on this file depend on the concrete implementation you're using. Please read each provider's documentation for more information. If you're deploying on Wildfly or EAP, please check if the WEB-INF/jboss-deployment-structure.xml requires any update. Please read each provider's documentation for more information. 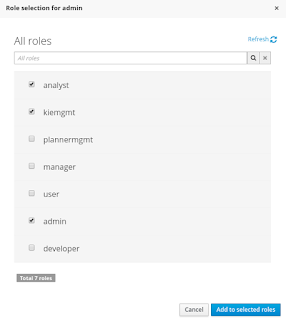 If you're building an Uberfire based web application and you want to include the user and group management feature, please read this instructions. When no concrete security management provider installed on the application, the user and group management feature will be disabled and no services or user interface will be presented to the user. Removing or commenting all the lines in the configuration file located at WEB-INF/classes/security-management.properties will disable the user and group management feature and no services or user interface will be presented to the user. Read the following sections for using both user and group management perspectives. 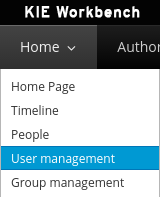 The user management interface is available from the User management menu entry in the Home menu. When specifying the search pattern in the search box the users list will be reduced and will display only the users that matches the search pattern. Search patterns depend on the concrete security management provider being used by the application's. Please read each provider's documentation for more information. By clicking on the Create new user button, a new screen will be presented on the center panel to perform a new user creation. The user editor, on the center panel, is used to create, view, update or delete users. 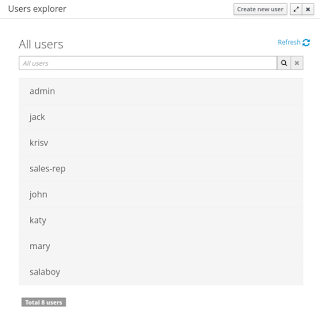 Once creating a new user o clicking an existing user on the users explorer, the user editor screen is opened. Existing user attributes can be updated, such as the user name, the surname, etc. New attributes can be created as well, if the security management provider supports it. 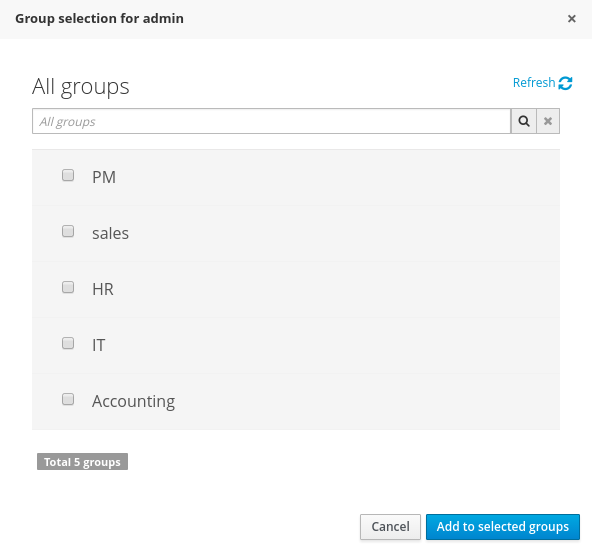 This popup screen allows the user to search and select or deselect the groups assigned for the user currently being edited. 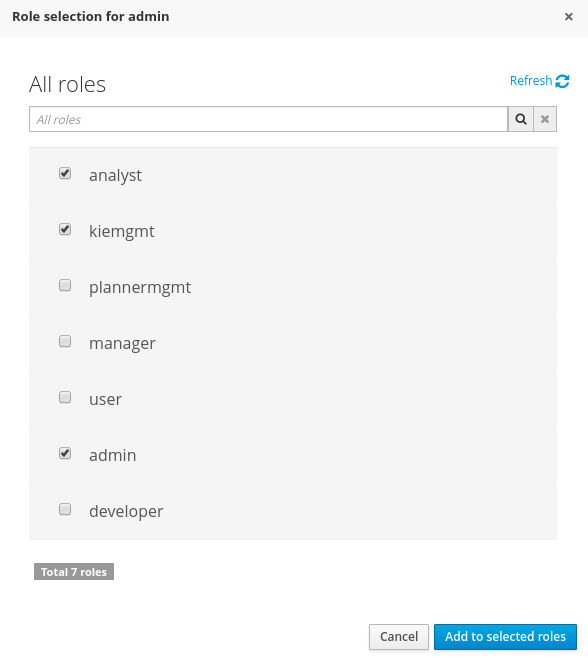 This popup screen allows the user to search and select or deselect the roles assigned for the user currently being edited. The currently being edited user can be deleted from the realm by clicking on the Delete button. 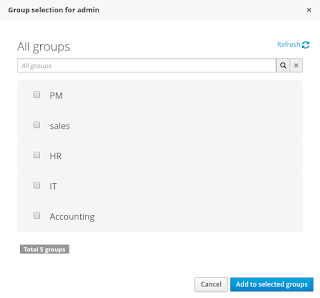 The group management interface is available from the Group management menu entry in the Home menu. 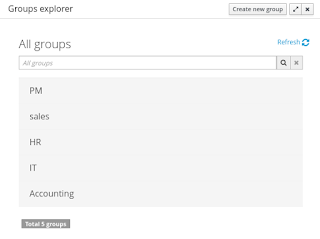 The group editor, on the center panel, is used to create, view or delete groups. 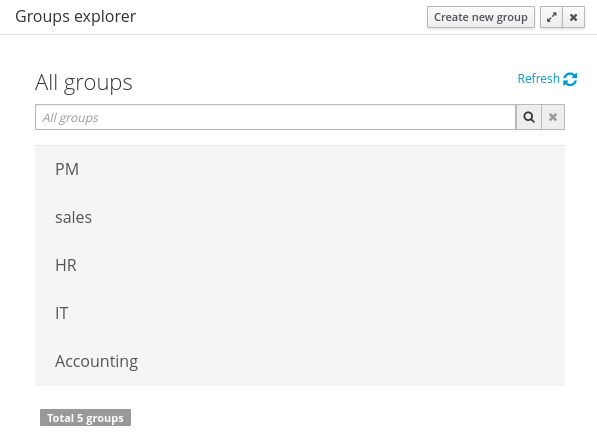 Once creating a new group o clicking an existing group on the groups explorer, the group editor screen is opened. 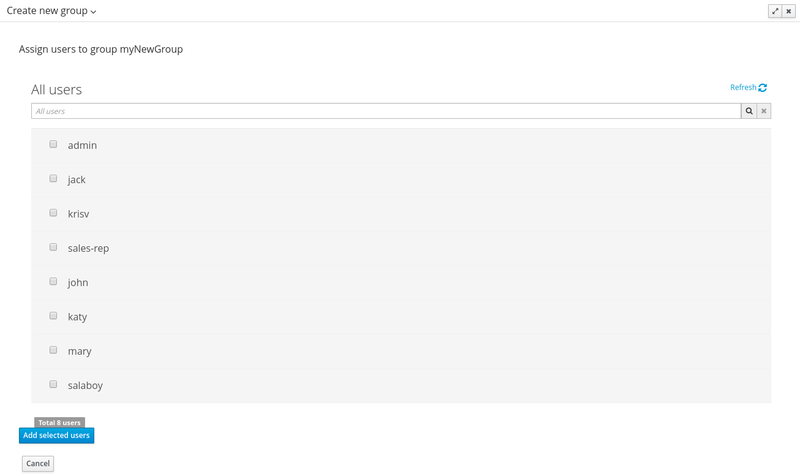 To delete an existing group just click on the Delete button.